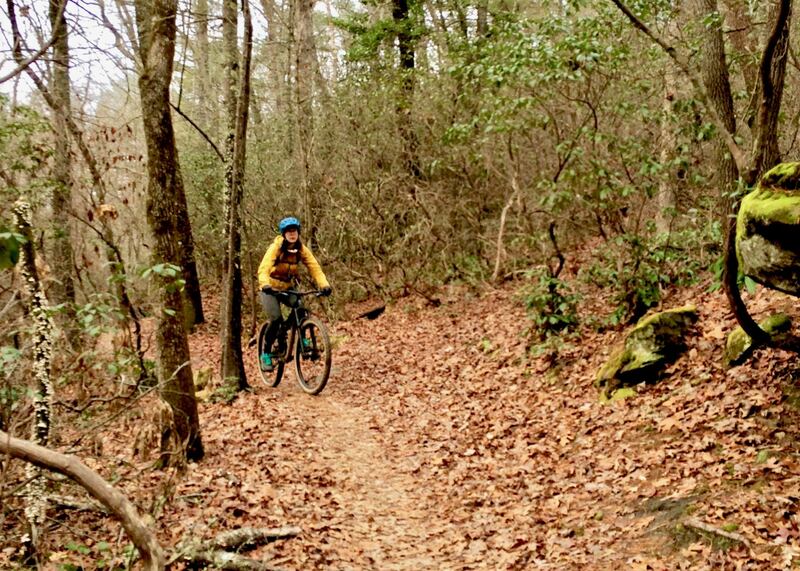 Dupont State Forest near Brevard, NC is rich with different riding options. On a recent vacation to NC (which you’ll be hearing more about soon), I was riding with my wife (20 weeks pregnant), my 3-year-old and my 6-year-old. With this riding crew I needed an easy route that would not include too much climbing or technical terrain. This route that we followed delivered. Before starting our ride we took a quick hike to several waterfalls and then parked in the High Falls Parking Lot. This lot features paved road access, bathrooms and a visitor center. From the visitor center we headed east on Buck Forest road. This is a wide gravel road through the forest which contains a moderate climb and then decent to the covered bridge. The covered bridge is absolutely gorgeous and is built right above High Falls. If you wish you can take a detour and check out the falls. After crossing the covered bridge we took a right and turned south onto conservancy road. This again is a wide gravel road that is an easy ride that we didn’t really need our mountain bikes for. After the just a short distance we turned onto our first single track trail for the day “Pine Pitch.” Pine Pitch is a one mile blue trail that features a bit of easy climbing to begin and then a nice downhill for the last 3/4 of a mile. There are a few roots and rocks along the way to keep things interesting, but the entire family had no problem clearing the entire trail. The trail terminates at a beautiful little lake, Lake Dense. If it had been summertime dangling our toes in from the dock would have been a chosen activity I’m sure. Pine Pitch then dumped us onto the Three Lakes / Lake Dense trail that continued past a smaller lake with a similar easy singletrack feel. The second lake does contain a bridge, but don’t be confused by it, it is not part of the trail and is only good for a quick photo-op. Micah riding across the bridge to nowhere. The Three Lakes Trail finished our singletrack for the day. We were able to take an easy pedal back on conservancy road back to Buck Forest road. Back in the parking lot my six year old gave me his feedback on this ride: two thumbs up!